Use 4RP to create and maintain, a strong and highly trained workforce. 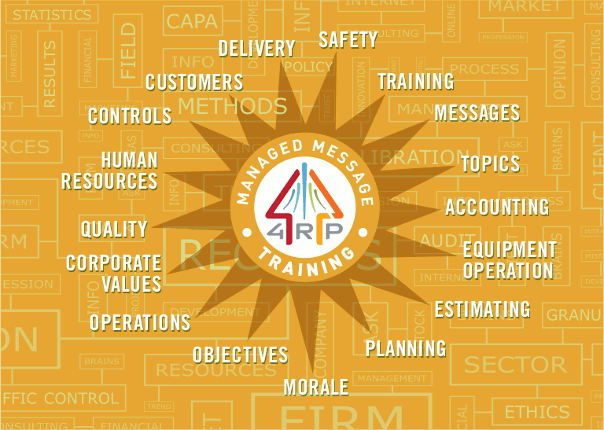 4RP Managed Message Training delivers “Training” as the overall message. The challenge of any corporation is to convert an average workforce comprised of normal people with normal recall and reasoning abilities into a strong and productive highly trained workforce. Workers need to be set up for success and the best way to do this is to deliver ongoing training in small doses in appropriate venues for maximum retention and effectiveness. 4RP packages USER training bites and provides for delivery of these training bites on an ongoing prioritized basis before a mistake is made. Training issues are kept alive in the minds of the workforce ready to be used when appropriate.